Netflix will debut the third and final part of DreamWorks Trollhunters, created and executive produced by Guillermo del Toro, on Friday, May 25. In the animated series’ final installment, the fate of both troll and human civilizations hang in the balance. The Trollhunters are racing to stop Gunmar and the resurrected Morgana from bringing about Eternal Night. To stop the duo, the team is seeking the help of legendary wizard Merlin. The cast includes the voice talents of Tatiana Maslany, Diego Luna and Emile Hirsch who join Kelsey Grammer, Mark Hamill, Lena Headey, David Bradley, Ron Perlman, Steven Yeun, Anjelica Huston, Jonathan Hyde, Amy Landecker, Charlie Sexton, Lexi Medrano and Fred Tatasciore. Maslany and Luna play Aja and Krel, two mysterious new students who come to the aid of the Trollhunters team in the fight against Morgana, voiced by Game of Thrones’ Headey. Maslany and Luna also will star in the next installment of del Toro’s Tales of Arcadia trilogy, which will debut on Netflix later this year. 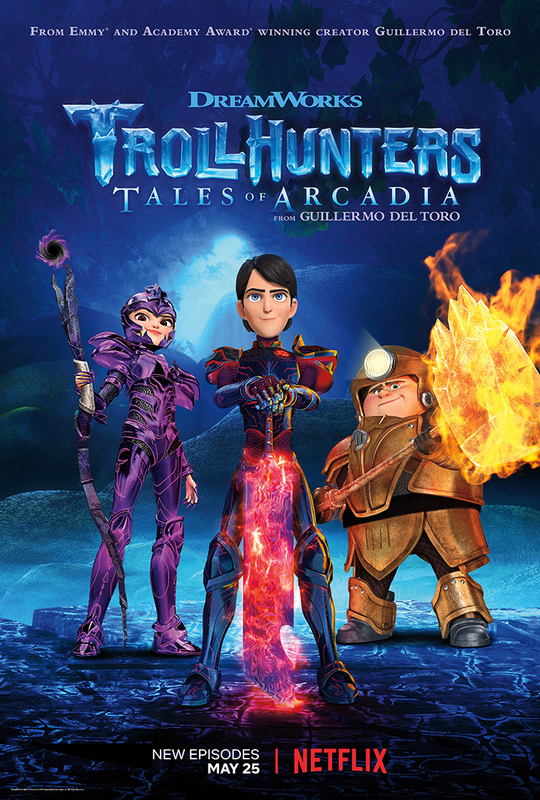 Hirsch steps into the role of the late Anton Yelchin, playing Jim Lake Jr.
DreamWorks Trollhunters is created and executive produced by del Toro with Marc Guggenheim (Arrow, Legends of Tomorrow), Rodrigo Blaas (Alma), Chad Hammes (Dragons: Race to the Edge) and Christina Steinberg (Rise of the Guardians) serving as executive producers. Dan Hageman (The Lego Movie, Ninjago) and Kevin Hageman (The Lego Movie, Ninjago) serve as co-executive producers. ​Besides Trollhunters, del Toro also is working on anthology horror series Guillermo del Toro Presents 10 After Midnight for the streaming service, Netflix said Monday. To produce it, del Toro is reteaming with Shape of Water producer J. Miles Dale, along with Gary Ungar.